As Valentine’s Day approaches, you might be feeling bummed about not having a special someone to spend it with. Or, if you do have a lucky person to keep you company on V-Day, you might still want to show your love and appreciation for the gals in your life. Valentine’s Day with bae might be exciting, but nothing can top Galentine’s Day. Even if you’re skipping Valentine’s Day, Galentine’s Day is a must this year. Celebrated as an unofficial holiday on February 13th, Galentine’s Day is all about your favorite ladies. The holiday was first coined by Leslie Knope on “Parks and Recreation” who says that, “it’s only the best day of the year!”, and the staff at VALLEY agrees. We all have so many amazing, important women in our life, so why not take a day to celebrate our love for them, too? Galentine’s Day is the perfect excuse to spoil your BFFs and girl gang (or your mom) with all their favorite things. Who doesn’t love a good face mask, candle or new pair of earrings? Need some last-minute ideas? Here are eight gifts that are perfect for every gal in your life. No matter who she is, every girl likes to take trendy pics. This old-school gift is great for a friend who loves to obsess over her Instagram aesthetic … and maybe she’ll even let you borrow it. A great gift for a girl who’s always on the go. You can never go wrong with a bag that’s functional, simple, and stylish. Every girl loves to throw on a soft, comfy sweater, especially in this State College weather. The best gift for your friend who needs to relax after a long week of studying. If you have a friend who loves to get the perfect picture for Instagram, whether it be on gameday, a weekend getaway, or at Sunday brunch, a new pair of sunnies is the gift for her. Getting a candle as a gift might seem like the easy way out, but there’s nothing better than lighting a candle and making your space smell fresh and sweet. For your next night out, weekend trip, or even spring break, your BFFs will love a new pair of earrings. You can never go wrong with food. Treat your besties to a nice dinner out or a get food delivered for a fun, lazy night in. Either way, you’re spending time with your best girls, and that’s all that matters! Head downtown to Urban and H&M for some last minute shopping. But regardless of the gifts, make sure you tell the women in your life how much you love and appreciate them. You wouldn’t be the same without them! What Does Valentine’s Day Mean to Guys? 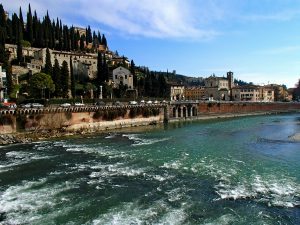 Taking a break from our weekend-long traveling expeditions, my roommates and I went on a day trip to Verona, Italy. This town is said to be the set of Shakespeare’s most famous love story, “Romeo and Juliet”.